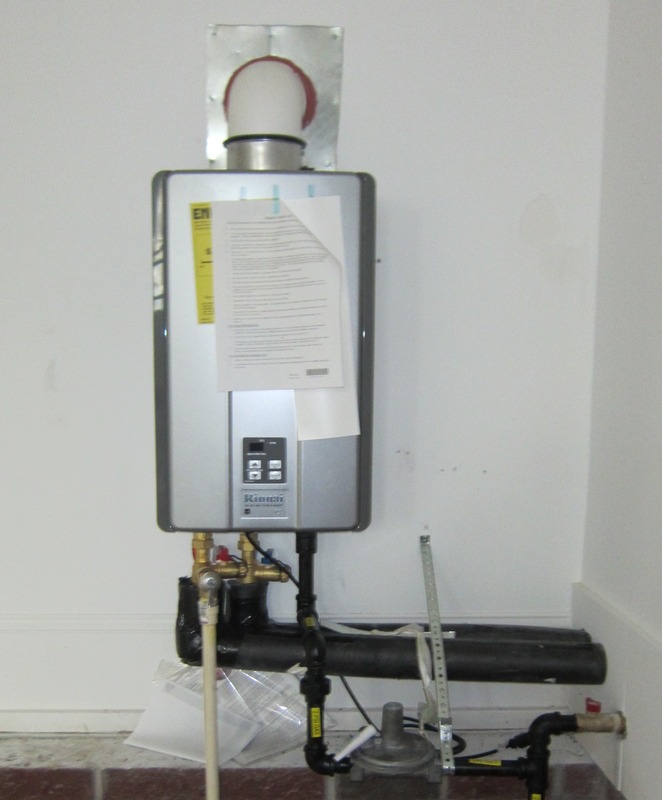 Residential tankless water heaters are becoming more popular. This high-power device heats water only when you need it. Unlike hot water heater tanks, the tankless technology does not store any water internally, except for what is in the heat exchanger coil. This month, twelve years after purchasing a new home, our original 50-gallon tank water heater needed replacing. The last time we had bought a new hot water heater, was in 2002 for a previous home. The total cost, including the tank and installation, was around $700.00. Let’s fast forward to today and today’s prices. My wife and I consulted with local plumbers. The quoted estimates ranging from $1400.00 to $1800.00. Even though over ten years had passed, we still suffered a mild case a of “sticker shock”. This caused us to slow down, rethink, and look for alternative solutions since we plan to keep living here for the foreseeable future. We are almost empty nesters now, three children down to one, we realized our hot water needs were much less than in previous years. Fewer showers and baths, dishes, and clothes meant less demand for hot water. That meant after our morning showers, we were paying to maintain 50-gallons of water at 120 degrees for the rest of the day. This seemed wasteful as far as dollars and adding to our “carbon footprint”. Unless you manually shut off a conventional tank water heater, it is constantly heating the water inside whether needed now or not. Two alternative solutions we discovered were 1) solar and 2) natural gas/propane/electric tankless. Since our home already had natural gas infrastructure, we decided to investigate that option first. The tankless technology is still somewhat new, but no longer brand new. Prices have come down to reasonable levels since those who paid “early adopter” costs. Plus with added rebate(s), interest free financing for twelve months, and the continuous savings by using much less natural gas, a tankless unit could eventually pay for itself through efficiency savings over its twelve year unit warranty. Rinnai Luxury Tankless Water Heater. That is a valid question. On a strictly a cost basis, it may not make sense (dollars and cents) initially. Yet, what we do have is continuous, 120-degree hot water, on demand for hopefully as long we own our home. Also, we have reclaimed approximately thirty cubic feet of space in our garage for much needed storage. Only time will tell if this was a proper financial decision or not. So many variables and unknowns are in the equation. For instance, 1) Will the tankless unit perform as advertised and at least as long as under warranty? 2) Will we continue to live in this home as long as we foresee? 3) What will the price of natural gas be in the future? As of this writing, it has only been a few days since the new installation. So far, so good. We are looking forward to the savings on the next gas bill! This entry was posted in Family, Lifestyle, Technology and tagged hot water heater, review, Rinnai, tankless heater by John Alford. Bookmark the permalink.